It's easy to hate Aslanis. I know most fashion people do. You probably do too. His collections are kitsch, over-the-top and quite tacky, to be frank. But I will still post about the show I attended last night. Why? Well, like I've said before, Aslanis isn't just about the clothes. 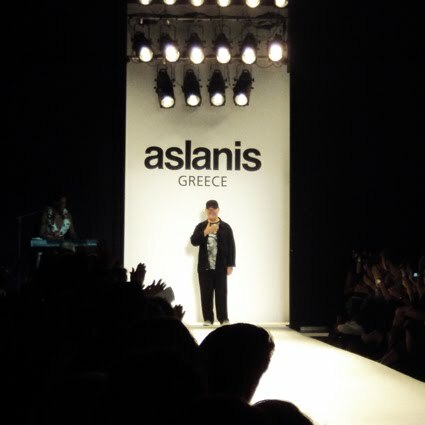 It's about the surreal experience of the runway show he throws each season and the history of the most successful (meaning the one who has been around since forever and has a fanatic client base) mainstream fashion designer in Greece. Do I personally like the clothes? Other than this, not much. But I have to give you my view of the collection, no? It was long. Very long. More that half an hour, which in fashion-wise is TOO DAMN LONG. But the man makes lots of dresses and he has to show them. And the venue was hot. Very hot. And sweating is totally not chic. As always in Aslanis collections, it was all about colour, florals, flowing muslin and silk satin, head scarves and heavy embellishment in all forms. Several semi-celebrity Greek ones of course, but also a couple of non-Caucasian ethnic types. Kudos for the (small but trying) diversity. And actually, there were some pieces that weren't that bad. Or this yellow maxi dress. Also, the fact he sends his bright coloured dresses down the runway grouped in one colour each time, is actually quite practical. Saves time for those who are actually looking for a dress in a specific colour. ...including this super cute little girl! 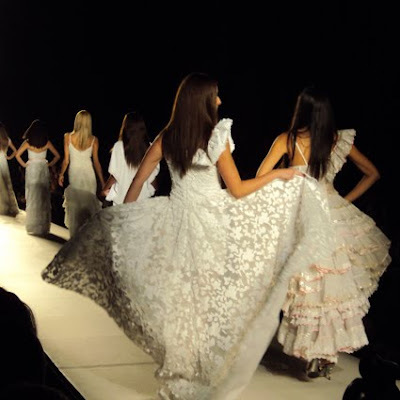 And of course, let's not forget Aslanis' signature piece, the best-selling category in Greek fashion, the meringue wedding dress! Actually, a sea of them. Seriously, the brides were sent down the catwalk all at once in their huge wedding gowns, meaning there was actually some traffic jam at the turning point. Overall, a fashion show experience that can't be ignored and a longtime career in clothes making that shouldn't be overlooked. More Aslanis SS2011 over at Alecca Rox, Shopping Therapy, Life Full of Fashion, Fashion Algorithms and Dare to Be Unique. Hi Lopi! You covered the show like a pro.I also love to hate Aslanis,heis like a moving history greek fashion wise. Εμένα μου αρέσει και το πρώτο και το δεύτερο (το Έλενα Ναθαναήλ καφτάνι) και... τελεία. Ως παντρεμένη δε έχω να πω, πως αν κανείς μου χάριζε, όχι μου πρότεινε, μου ΧΑΡΙΖΕ τέτοιο νυφικό, θα με έφερνε σε τεράστια αμηχανία. I actually quite like the black and white number in the 3rd pic! That sounds like a long show to be hot in hun! i think everything was too much!flowers are good,silk is good,maxi dresses are nice,colours i like..BUT all these on a dress? ?too much...but we love aslanis anyway!i choose the black and white dress. Give a frock a home, today! My moo cards are here!